How does sda natural indigo denim fade? Anyone here have faded examples? 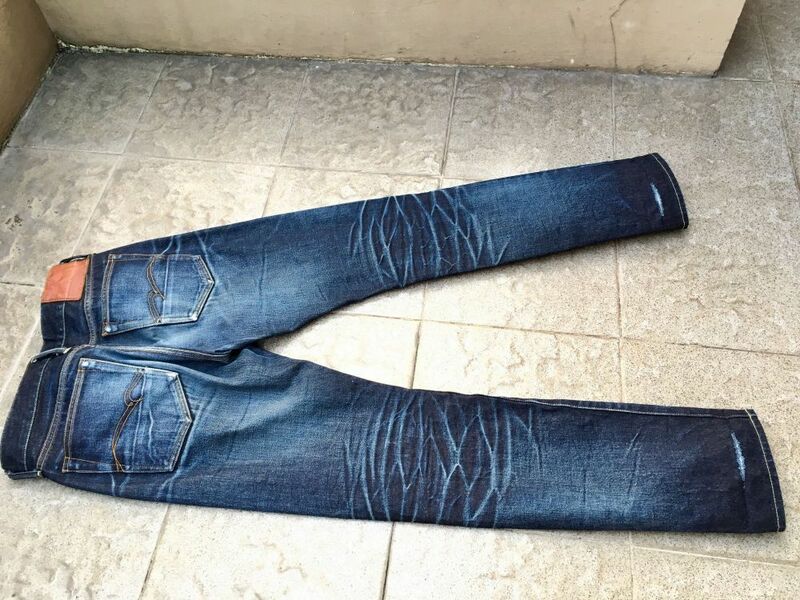 I saw a pair of dO1s and the lighter shade of the natural indigo looks nice and different. Real life measurements if my SD-108 after wearing them a day. I have worn them a few more days since I took those measurements and they surely have stretched a bit more. They are called relaxed tapered at some shops but they are from it. 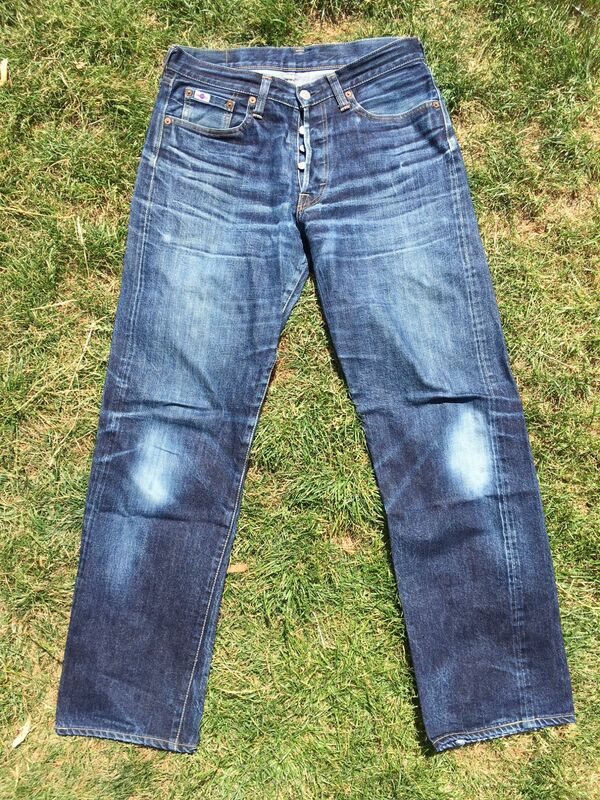 They are a slim tapered cut with a rise that is rather low than midrise. Measurements are pretty similar to the UES 400ST. I try to get some fit pics up soon. @beautiful_FrEaK looking forward to fit pics. Where did you get your SD-108's from? 108 is up on Denimio. 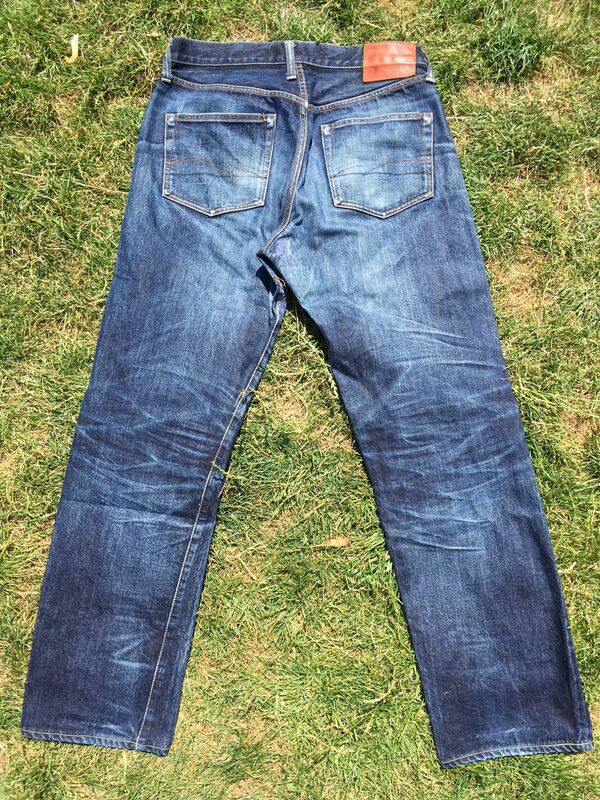 @beautiful_FrEaK Going by those measurements you shared, SD-108 is Tapered for sure. Seriously tapered I mean. 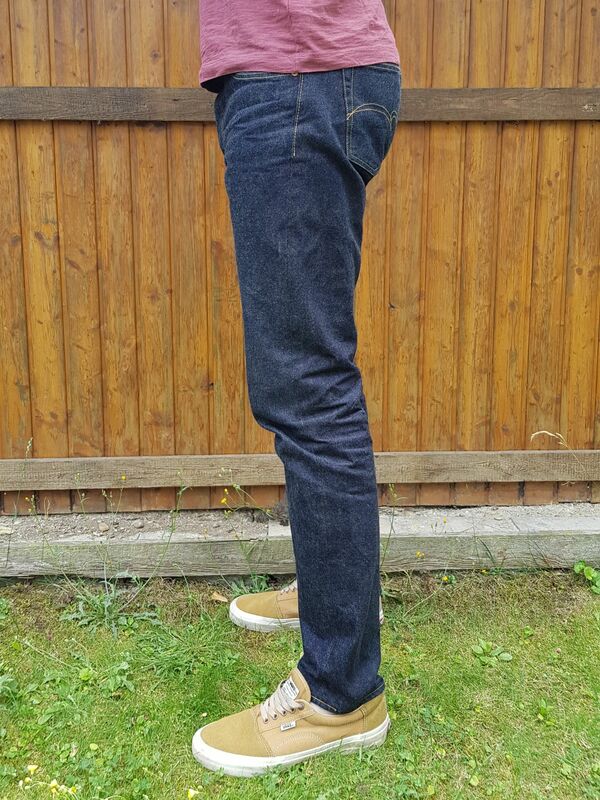 But the front/back rise and thigh measurements are confusing for a 'Relax' tapered fit. They don't seem relaxed at all. 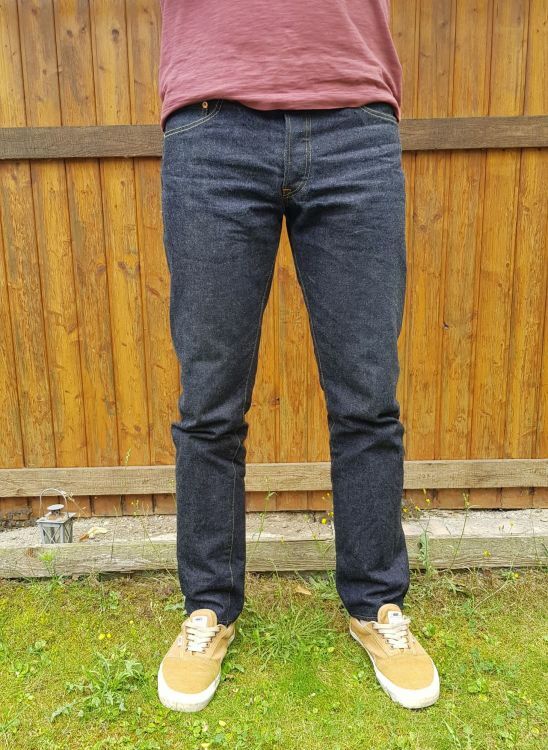 Finally the fit pics of my new SD-108. Finally reached 8 months and its time to wash my sda! Follow my instagram account @mrizky_denimevo for more fades! Does anyone have any experience with the one wash version of the SD-101? I managed to get a pair new with tags fairly cheap on ebay, tagged 36 inches in the waist, but I was surprised at how stiff the Denim is, it doesn't seem to have any give in the waist, which is a "hard" 34 inches at the moment. Coupled with the low-ish rise it makes them fairly uncomfortable. They’ll soften plenty and give a little with wear, what do you want to know about them? Just with regard to the waist really, I was surprised how rigid it was, also it's fairly low rise for what is obviously their version of a 50's cut. Agreed, they don’t have a high rise, although I’d call them on the higher side of mid-rise, definitely not low. 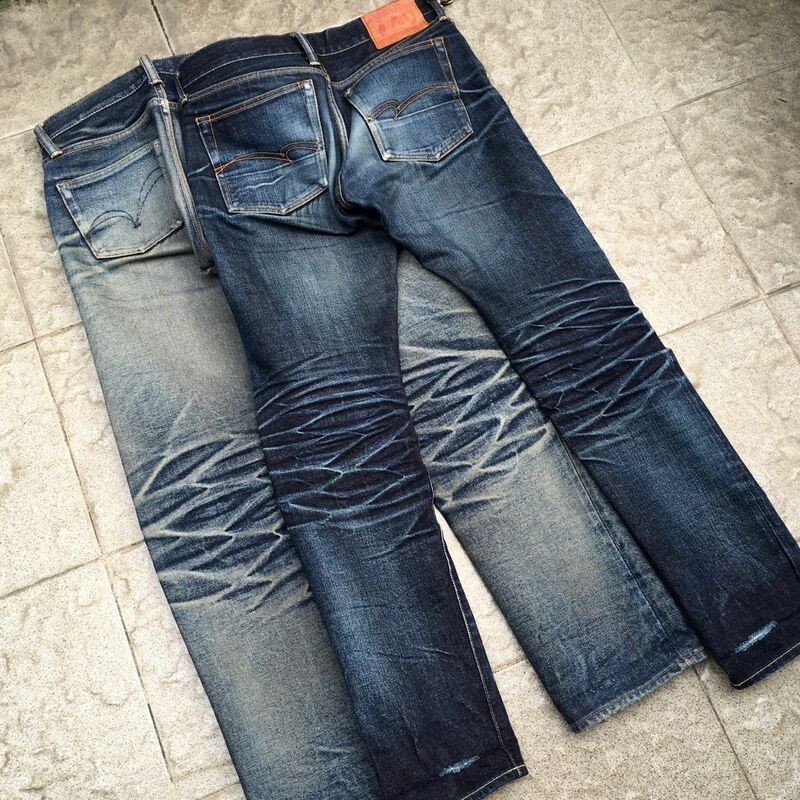 They will stretch an inch or two in the waist but not without a fight and it’ll take longer with these than almost any other denim. Patience is the key. 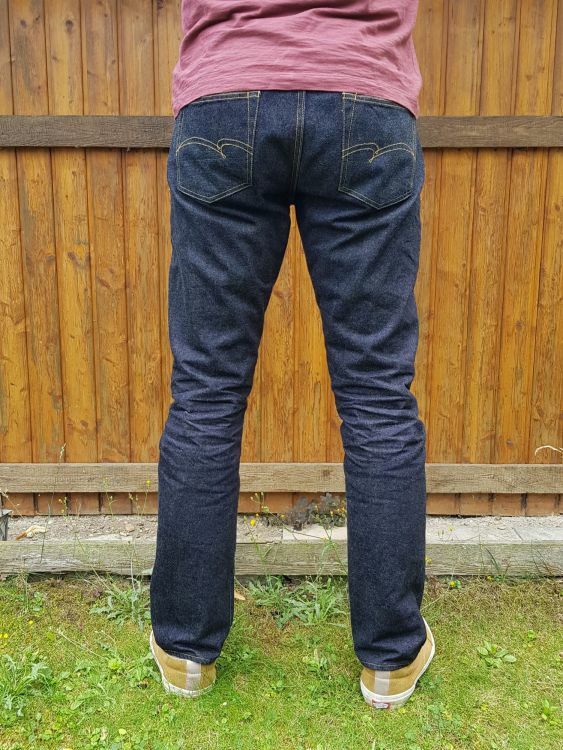 It's my first time with anything from Studio D'artisan, raw or one wash, so I'm not familiar with the denim at all, but I am starting to think it might be the whole top block I have the issue with an not just the waist, there's just a bit too much discomfort in that whole area. 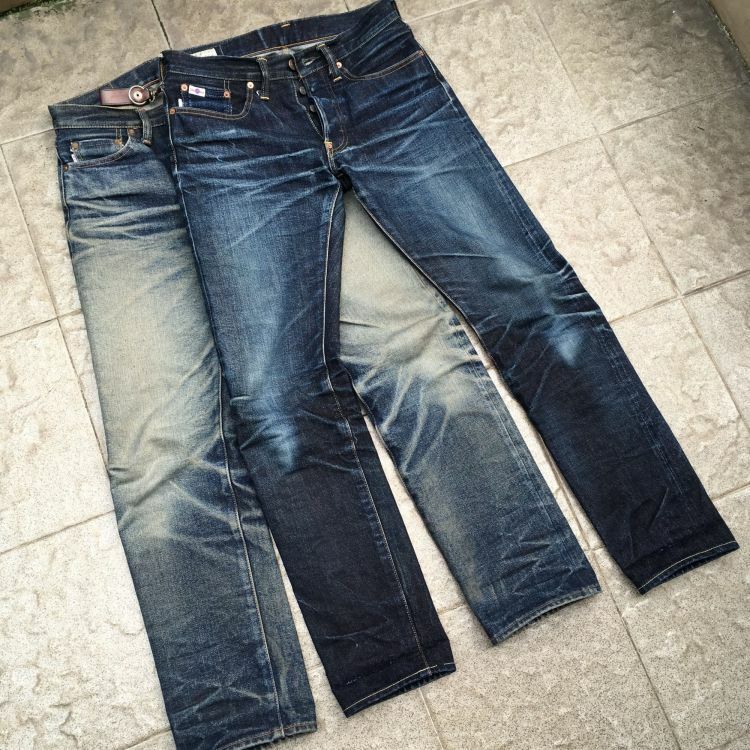 Not sure if I should put them back on ebay or give them another soak and wash.
SD-101, lots of wear and washes but unfortunately neglected for a few years. I’ll bring them out if retirement this winter. You got some measurements of the top block (waist, front and back rise, hip and thighs) for me?! I'm not really 100% sure where to measure the hip and thighs from? Can you give me a clue? With a back rise of 15" I understand why you have the feeling of a restrictive top block. 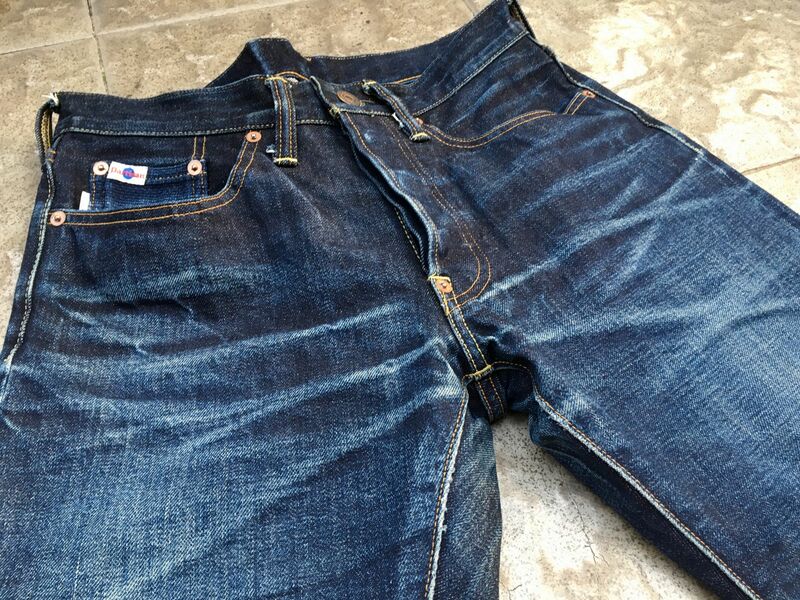 Thighs are measured mostly from the crotch seam to the outseam and the hip just across the jeans, roughly at the lowest button. In that case the Thigh is roughly 13" and the Hips roughly 22.5". If you need anything else just PM me. 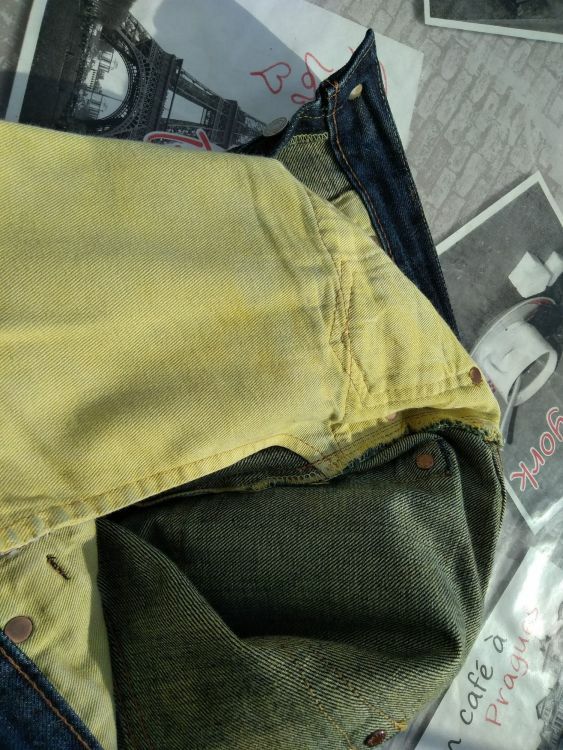 I got a pair of old SDA 102s off of ebay some time ago, they still have the tab on the right side of the right backpocket, with a blue dot on it, and they are overdyed in yellow. The seller told me they were some kind of special edition for a store somewhen around 2007 or so. 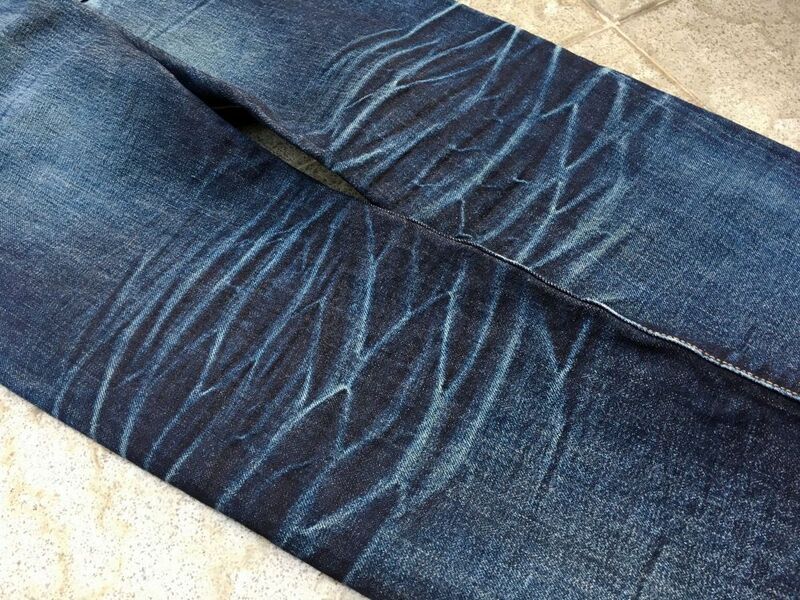 Well anyways, I was wondering, if any of you guys knew more about overdyed SDAs. they do make special runs for their own stores and certain retailers - if it's from their own store you might have a chance finding info in the respective blog. does it have an article number on the internal labels? 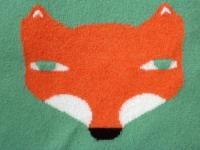 Thanks for the info @Foxy2, I'll look around for it. Also some pictures of them (https://imgur.com/a/H6lcijL), please excuse the partly bad quality. Hope the link works, direct upload doesn't seem to work, or I just don't get it. Are you sure they’re overdyed or is that just a tea-coloured weft or something similar? Pretty sure, see the pocketbags. Isn't the 102 made in the standard 15oz indigo denim? Kind of hard to read the patch as is. Maybe I just got an experiment from someone at home. 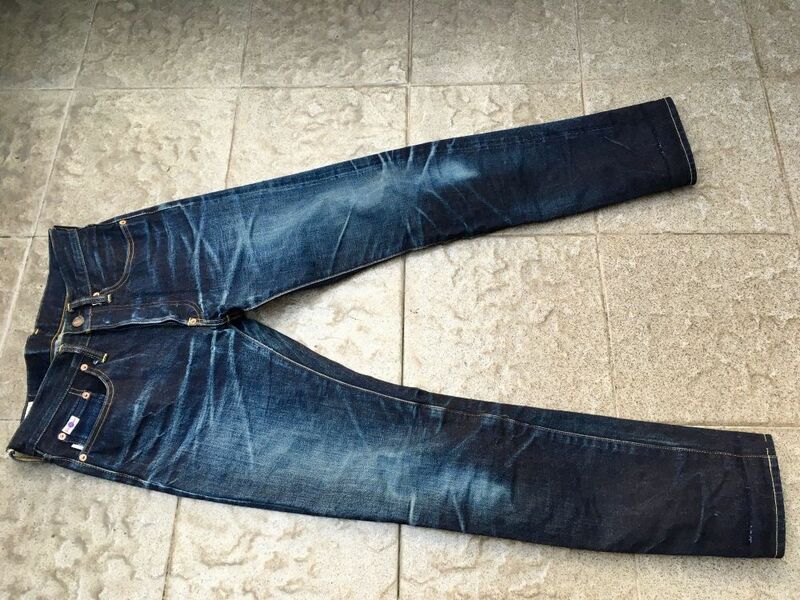 I think you’re right, they are overdyed but whether that was before or after the original purchase is likely to remain a mystery!